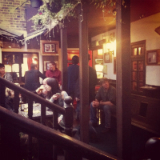 Significantly pre-dating the surrounding properties, The Lion and Lobster is one of the oldest and most traditional pubs in Brighton and Hove. Spread over three floors, including a pub area, regency restaurant and a hidden roof terrace, the pub is the perfect spot to while away a few hours, whether you’re looking for a relaxing drink, fantastic home-cooked food or both. It’s the kind of place you can’t wait to introduce friends to, a true home away from home and one of the best kept secrets around.